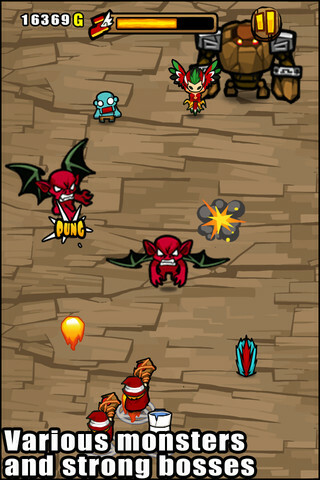 An RPG endless-runner? Why not throw in a shoot 'em-up too? There are three things going on in this particular hybrid adventure that's just appeared on the App Store. First and foremost, it's a vertical endless-runner. Secondly, the characters under your directional control automatically fire a concoction of flames, arrows and sword-swipes in the style of a classic shoot 'em up. Finally there's the RPG element, and each character you start off with has different stat perks. There's a partying mode of sorts too, as you can unlock fighters from cages as you travel, and have them join you on your genocide. Once you've picked a starting character, you embark on this scrolling journey along the world's longest screen, and it's one that's populated with a decent variety of enemies. Some are straightforward soldiers who will slice straight at you, killing you with one blow. Others fire arrows at you from the other side of the screen, while also dodging your automated attacks. 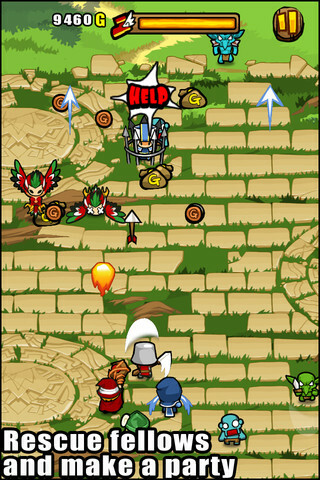 Most of the enemies can be bypassed using the metered run-boost option which increases your speed, although some will leap ahead to continue fighting. Cheats. You can either tilt or tap your way to glory, and it won't surprise long-time readers of Modojo to know that we vastly preferred the directional tap controls. You simply can't eke out the necessary sensitivity to succeed via tilt, and you'll struggle to coordinate steering with starting up those run boosts. Besides, it just makes you look silly in public. Every few hours you'll get the chance to take part in a Challenge mode, where an avalanche of enemies descends upon you with unparalleled ferocity. The thing is it's just a little too challenging, and while the cash rewards are generous, there's such a wide gap between attempts that you'll struggle to get very far in it at all. If, as a result, you're struggling for money, you can always laugh you way into an early grave by heading into the cash shop where you can pick up 20,000 gold for a dollar, or a million for the ungodly sum of $19.99. Please don't do this, it just makes life harder for everyone else. While we had our fair share of frustrations with the game, going greatly in its favor is that it offers up more reason to persist than most. There's a generous selection of different fighting forces to be unlocked with the cash you pick up, so if none of the three different warriors you start off with are to your taste, you can work towards gaining some new ones. Character stats can also be upgraded in exchange for coins. It's hard to overwhelmingly recommend The Lord of the Roads because the actually gameplay is either your cup of tea or it isn't. It's nice that it's something different in such a clone-happy genre, but the aiming and firing methods often felt unsatisfying. Still, if you have an endless thirst for these sorts of games then we think you'll get a little more out of it. What's Hot: Great artwork and a refreshing twist on the endless running genre. 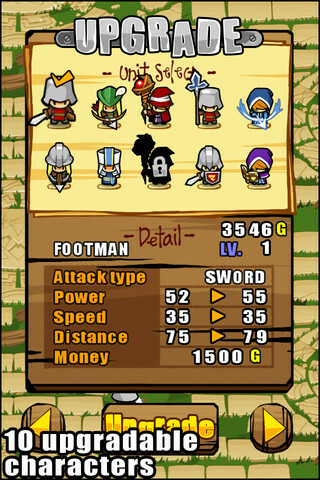 Plenty of variety in the character options and enemy types. What's Not: Firing can be frustrating, disappointing Challenge mode.